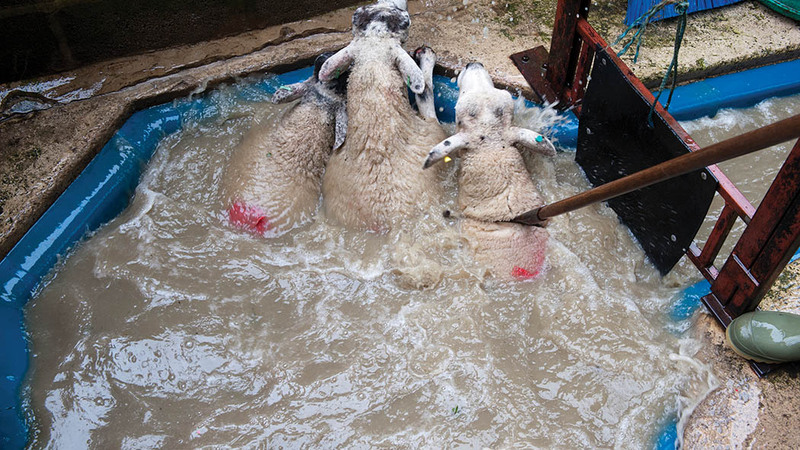 Eradicated in both Australia and New Zealand, sheep scab continues to blight the UK sheep industry, despite a compulsory dipping scheme from 1869 to 1992. Laura Bowyer reports. There is now evidence of resistance in scab causing mites to the 3-ML endectocide products – those containing doramectin, moxidectin and ivermectin. With many farmers favouring these products in recent times on the grounds of human safety and ease of administration, it is becoming increasingly important to use these endectocides responsibly to safeguard them for the future. Costing the UK sheep industry £8.3 million annually, once the reduction in productivity and treatment has been accounted for, scab is a not a problem to be sniffed at, and with the recent resistance news, there is likely to be much more focus on controlling the parasite moving forward, which is still a notifiable condition in Scotland. A real welfare issue for many in the industry, it is widely considered that a minority of less responsible sheep keepers are causing problems for the majority and it is fact that without a cohesive approach to tackling this external parasite, no improvements will be seen. Although not strictly a seasonal problem, the risk of scab is likely to worsen from autumn through winter as the mite needs moisture to survive. Persistent in character, the mite can survive for 17 to 18 days off the animal. A scab infestation can be a particular welfare problem at lambing time, with lambs pulling at their wool and it can be difficult to treat these young animals accurately. Furthermore, severe itching in pregnant ewes can significantly reduce their feed intakes, resulting in insufficient milk production and metabolic conditions such as twin lamb disease. Sheep with the condition can develop enlarged lymph nodes and once found in an abattoir, will be immediately condemned. The subclinical phase can last for weeks or months, where the condition may go unnoticed, but if untreated will ultimately lead to death, stated Dr Bates. In the early stages of the condition, some sheep may be seen fitting and foaming at the mouth, similar to those with scrapie. Swaledales and Scottish Blackfaces are reportedly less susceptible, experiencing slower lesion growth and a lower mite population, perhaps due to a more kemp-filled fleece. Commonly identified by a loss of wool, as a result of intense itching, scab can often go unnoticed and up to 60 per cent of a flock can be effected at the point of veterinary intervention, according to Dr Peter Bates, livestock entomologist, speaking at a recent Bimeda event. Also speaking at the scab control event was Lesley Stubbings, independent sheep consultant, who said the timing of the event (January 23) was very appropriate given the mite resistance challenges the industry now face, which were not realised some six months ago. The lesion commonly associated with scab is an allergic reaction to the faeces of the mite Psoroptes ovis, explained Dr Bates. “This reaction produces an exudate which the mites feed on. The lesion itself is progressive, growing in size as the mite population increases. “There is a certain amount of natural resistance among the sheep population and if the animal is not allergic to the mites’ faeces, it will not produce an exudate, and so without a food source, will leave the animal. In research carried out in 2007 and 2008, it was found 30 per cent of flocks in the UK experienced an outbreak of scab almost every year in the previous 10 years. Wales is a hotspot for scab, largely because of the high sheep population, but it is found throughout the UK, although to a lesser degree across the Midlands. 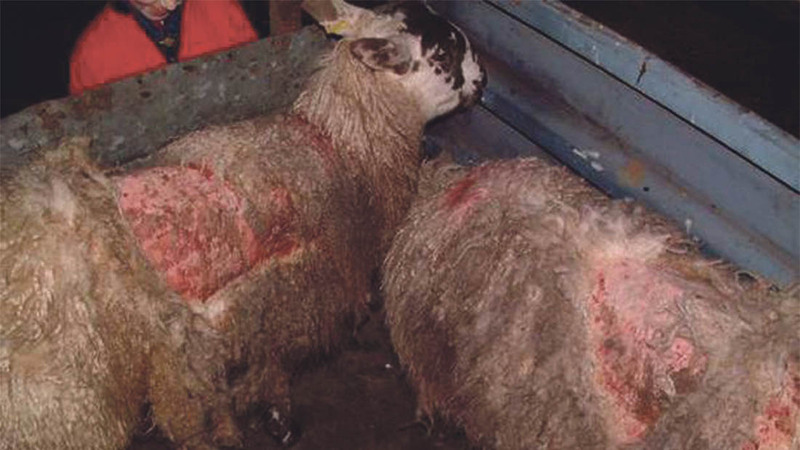 The biggest cause of the spread of scab is neighbouring sheep and strays, followed by farm-to-farm movement, and then at livestock markets, although it is illegal to sell stock known to be infested with the mite. Mr Bates explained there is no product in the UK licensed to be used through a sheep shower; the required concentrates are unknown, as well as the effectiveness, and it will certainly not kill mites in the ears of sheep. Sheep showers also pose a potential risk to the user as the OP diffuses into the air, and the risk to the sheep of inhaling these products is also unknown. 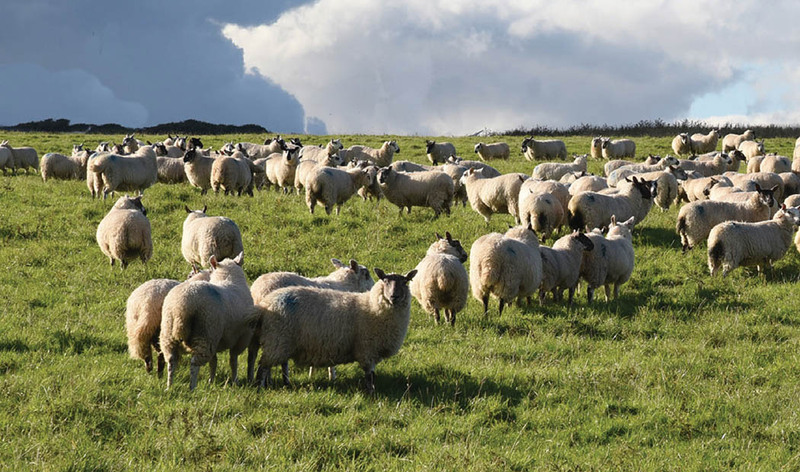 Closed and lowland flocks are often considered to be at low risk but in any situation, lambs and hoggs are most susceptible as they are still developing an immunity. Purchased store lambs can often bring the parasite on to a farm, or indeed, purchased rams. “This is an individual sheep keeper’s problem and until everyone takes this on, we will not get rid of it,” Ms Stubbings said. “Making scab a notifiable condition, as it previously was in the whole of the UK, could make matters worse,” warned Ms Stubbings. “This could drive the problem underground. Neither is compulsory dipping going to return, given the human health implications but we need to seriously look at dipping again as a real cause for action. The word resistance is being used at increasing levels throughout the livestock industry. Ms Stubbings explained resistance is the ability to survive treatment under the correct dose. Organisms which carry two copies of resistance gene will survive the correct dose and go on to produce the next generation of that organism. Ivermectins were introduced in 1996 and once licenced for scab became a popular weapon in the fight against the parasite. Their popularity furthered again once synthetic pyrethroids were banned in 2006. Overuse of injectable endectocides can select for resistant mites, and being with combined anti-parasitics, also for resistant worms. If resistant mites are found within a flock, dipping in an organophosphate can ‘reset’ the problem, getting rid of the resistant population and then the 3-MLs can then be used again if the problem returns. Ms Stubbings said: “In 2017, 80-95 per cent of sheep treatments for scab were injectable endectocides, rather than OPs and this is what we are trying to turn the tide on. “They are safer and easier to use but they do not protect the sheep for as long. Yes, they worm the sheep at the same time – but it is not necessarily the right time and they select for resistance. “We need to protect the effectiveness of the 3-ML group as resistance to endectocides is now a reality. Report cases of a lack of efficacy to the Veterinary Medicine Directorate (VMD) or the manufacturer,” she said. In the case of suspected endectocide resistance, it is suggested an OP plunge dip is used. He added it is important to get the concentration of the used OP dip correct to ensure its efficacy. Sheep need to be immersed for one minute for the insecticide to be absorbed into the wool and on to the skin of the sheep. The diazinon dip will be retained well in the fleece and can provide eight weeks of protection against scab, he said. He suggested vaccination is likely to be the most effective way to combat this condition in the future, which although is not yet on the market, is under development at the Moredun Institute. A skin scrape or wool sample is widely used to diagnose a scab problem, however Biobest Laboratories has developed a new test for sheep scab, known as the ELISA test. Speaking at the scab control awareness event, Rebecca Mearns, senior veterinary adviser at Biobest, explained: “The test detects antibodies in the blood of the sheep, which are produced during the reaction to the mites’ faces. After a successful treatment, antibodies levels will reduce slowly, dependent on the degree of infection and the individual host’s immunity. Ms Mearns said: “The test is very accurate and there is nothing a positive result can be confused with. Only 12 ewes per 12,000 are required for an accurate result, if there is a prevalence of 20 per cent, which she says in most flocks is much higher, and two weeks are required between two blood tests. There is a similar resistance problem among the population of chewing lice, with resistance to pour-on products being reported. Lice feed on sloughed skin and bacteria and causes mild dermatitis and patches of wool will be lost. They have a longer lifecycle than scab-causing mites (34 days) but can still survive for up to 18 days in the environment, off a host animal.